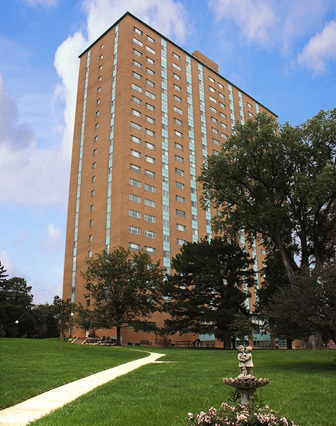 Elevate your life’s view at Elmwood Tower. Omaha’s original residential high-rise offers everything you expect in independent retirement living today. Every unit offers secure surrounds and stunning views at a low cost to you. Come home to this self-contained, centrally-located respite away from the hustle and the bustle. Select from one, one-and-a-half, and two-bedroom units, each with full kitchen and bath(s). Enjoy amenities like on-site laundry, dining room facilities, and the lighted, enclosed parking garage. Here’s convenient, secure, smoke-free, pet-free living at its finest for those 50 and older…without the responsibilities and high costs of traditional house ownership. Customize your space to your heart’s desire—even move walls, if you like—and elevate your life’s view in your new home. Fine and casual dining, grocery stores, entertainment venues and a variety of houses of worship are nearby in the neighborhood. We also like to keep our community involved with a diverse selection of social clubs and activities. View our gallery of photos, including floor plans, and contact us to take a tour and check out available units. This is retirement at its best – with an elevated view on life.